The Antiquities Coalition’s Chairman Deborah Lehr presented a program titled “Stolen Heritage: Cultural Racketeering in Egypt” at the Middle East Institute (MEI) on April 24. Speaking to a full room at the MEI’s Washington, DC headquarters, Lehr outlined the issues for the assembled experts. 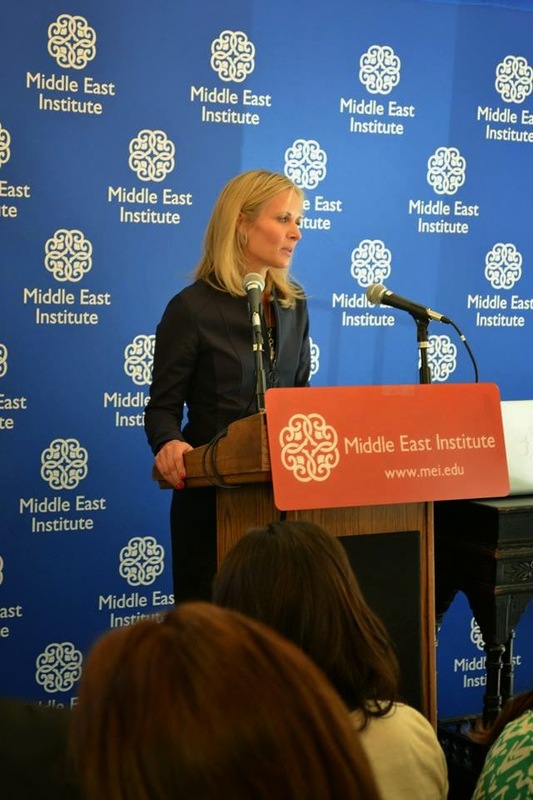 Middle East Institute on April 24, 2014. Cultural Racketeering is happening on a massive scale. It is organized and systematic. The looters are successful in their search for artifacts. There is large demand for Egyptian antiquities, which are showing up online and in auction catalogues. The downturn in tourism has had an effect on cultural racketeering in Egypt as well. The security and political situation has led to a steep decline in tourism. At a time when the Egyptian economy is weak, this downturn in tourism reverberates throughout the economy, but has had a particularly devastating effect on the Ministry of Antiquities. At the Antiquities Coalition’s March roundtable at the Egyptian Embassy, Minister of Antiquities Dr. Mohammed Ibrahim reported that revenues at archaeological sites and museums are off by 90%. Those fees go to the Ministry to fund its programs and that shortfall has comes at a time when resources are most needed to fight against these cultural thieves. Minister Ibrahim is being creative in his fight against looting as a result, working with the Egyptian embassies around the world to recover looted items as well as reaching out to the international community for support. The Antiquities Coalition signed the first Public Private Partnership with the Ministry to bring together the ingenuity and resources of the NGO and private sector to support the Egyptian’s efforts in this battle to save our common heritage. Cultural racketeering is a global problem that requires global engagement in the search for solutions. Looting is prevalent in Syria, Cambodia, China and many other countries. Solutions will come from within the country from the government and activists like Monica Hanna, who recently spoke about her work combatting cultural racketeering in an Antiquities Coalition presentation at the Woodrow Wilson Center. Many heritage organizations are doing excellent work at the grass roots or country level. But for this battle to be truly successful, it requires a global approach. The Antiquities Coalition is recommending that international institutions, like the United Nations take a leadership role in bringing together the international community to explore potential solutions. The United States government can also incorporate cultural heritage more fully into its discussions with countries at risk, including through its bilateral or multilateral strategic dialogues and proactively seeking cultural heritage MOUs. Finally there is an important role for public private partnerships – especially when resources are limited – to help in this global fight. The event was moderated by the MEI’s senior vice president Kate Seelye.